Yes, you read that title correctly. 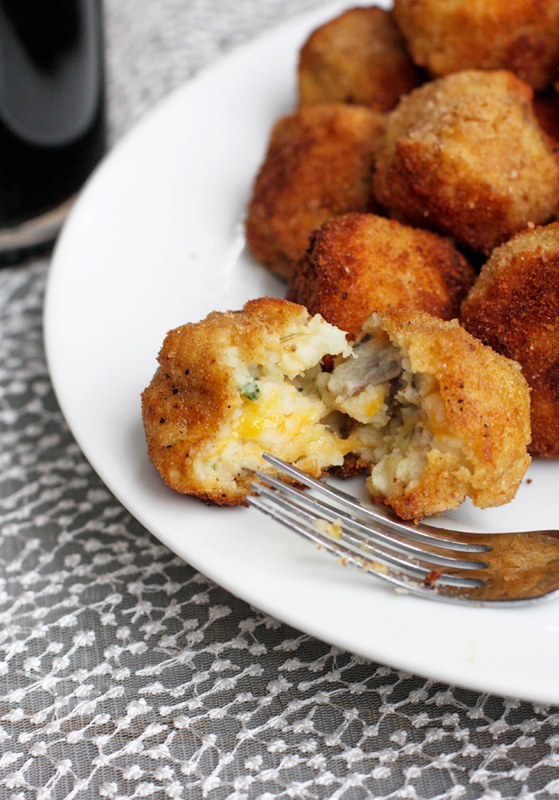 These are mashed potatoes combined with chives and cheddar cheese, then formed into little bite sized nuggets of amazing. You on board? Thought so. About a week ago, I finally cooked a turkey that my mom gave to me for Thanksgiving. It turned out awesome, and we had lots of turkey for sandwiches, salads and turkey soup. Of course we had to have a mini Thanksgiving dinner, complete with mashed potatoes, gravy and brussel sprouts. 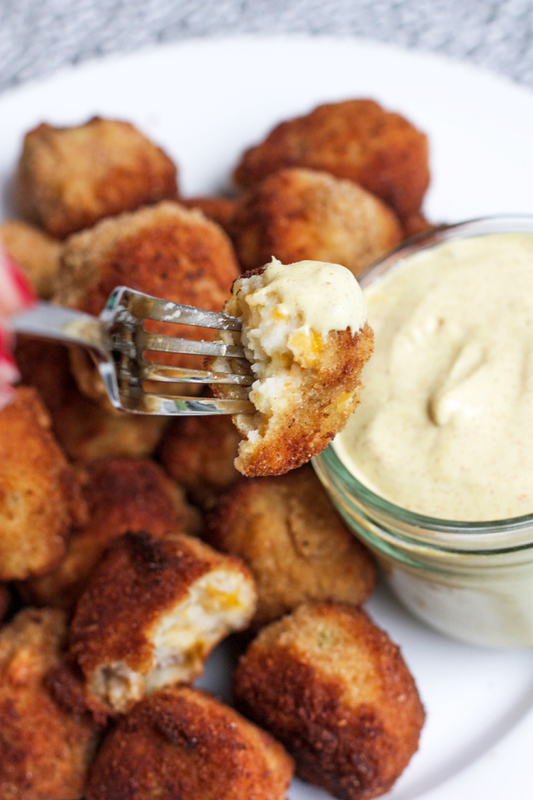 I ended up making way too much mashed potatoes, so I started thinking about what to make with them when it hit me: fried mashed potato bites. I couldn't get the idea out of my head! 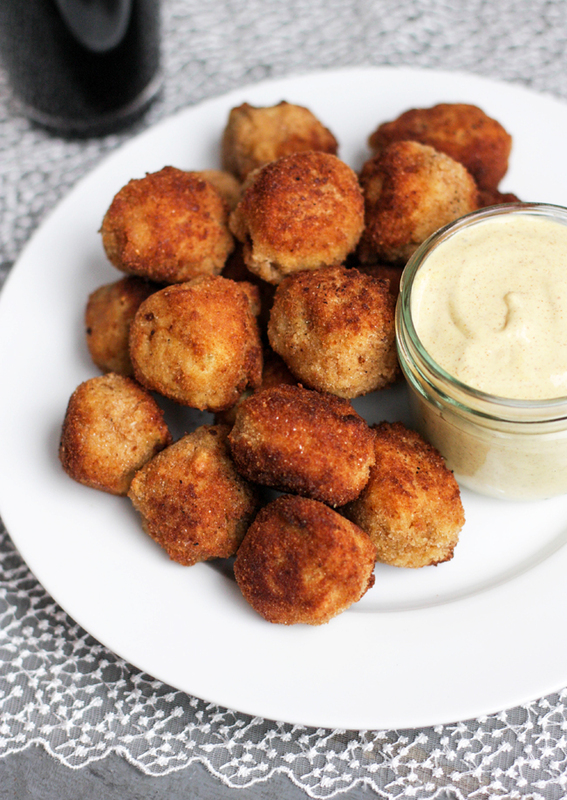 They ended up being everything I hoped they would be; these little bites are crunchy on the outside, warm and cheesy on the inside. I chose to dip them in a mustard sauce, but ketchup would be yummy too! *Makes about 40 potato bites. Perfect for a party! 1. Mix together potatoes, cheese, chives and mustard. Season with salt and pepper if necessary. 2. 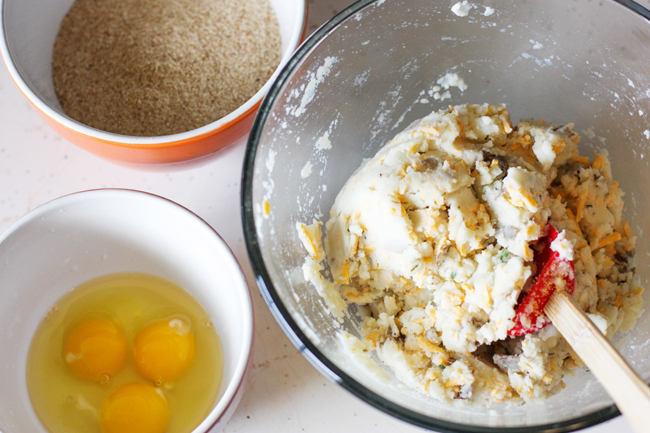 Place eggs and breadcrumbs into two separate bowls. Whisk eggs. 3. Using a tablespoon of potato mixture, form balls. Place ball into egg mixture, coat in breadcrumbs, place back into egg mixture and coat with breadcrumbs again. 4. After all balls have been coated in egg and breadcrumbs, heat approximately 1/2 inch of oil in frying pan to about 350-375 degrees. 5. 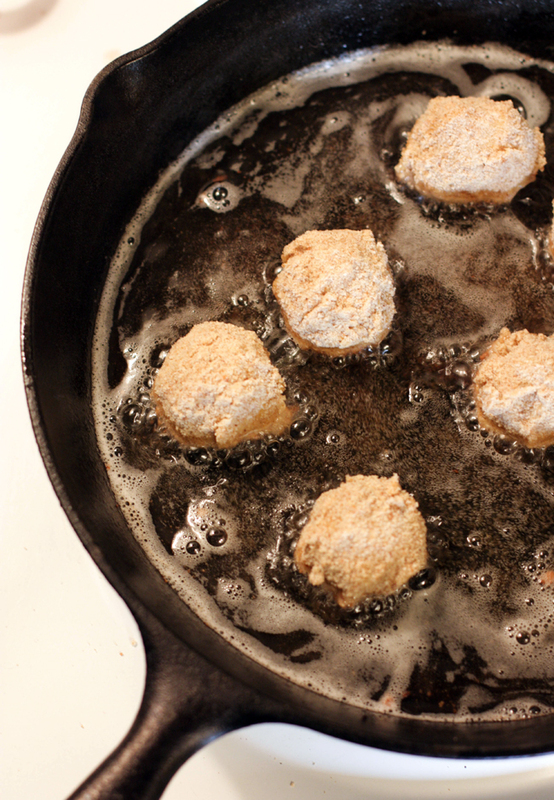 Before frying, cover a cookie sheet with something to absorb extra oil. I used a grocery bag, but paper towels would work too. 6. Place about 5-7 bites into oil, and let cook for about 30 seconds (or until golden) and turn until all sides are golden brown. Place potato bites onto cookie sheet. 7. Serve immediately! I stored my leftovers in the fridge and heated them back up in the oven. The microwave worked alright in a pinch. these look sooo good! definitely need to try to make them. GURL. I need these in my mouf. oh my goodness delicious. so many good things in one little bite!